In many respects Her is as standard a rom-com as they come. The story is the familiar one of boy meeting girl, except that in this case the girl is a piece of intelligent software that the boy has downloaded. It’s an unconventional love story which gains credence by being placed within the trappings of a rather tired genre. The structure not only helps us to understand and connect with the romance that plays out, but also adds depth to the film’s discussion of humanity and love. By contrasting the familiar genre structure with the unusual subject matter we are constantly asked whether the emotions on display are ‘real’ and whether it really matters if they are or not. Spike Jonze has the ability to take unusual and complex stories and bring them to the big screen as simply and as comprehensibly as possible without once sacrificing either the emotional or intellectual weight that lies within the script. A quick glance through his filmography confirms the point; whether he is controlling a film which details the writer’s attempt to write the film we are watching with Adaptation, or when he shows us a situation where an office worker finds a portal in his office that allows him temporary access into John Malkovich’s mind in Being John Malkovich, Jonze always manages to balance the emotional veins that run throughout the film with the complex ideas that are being explored, whilst somehow finding a disarmingly simple method of execution. Unsurprisingly Her is no different. By all rights a film about a man falling in love with his operating system should struggle to be relatable but instead this is one of the most charming, warm and quietly moving love stories I’ve seen in quite sometime. In a world where we are already talking to our machines (and where to some extent they are already talking back) this situation never really feels like a work of science fiction but rather a slightly exaggerated version of our daily lives. We find that we accept the situation almost unquestionably due to Jonze’s script’s ability to wittingly tap into that which already feels so strangely familiar to us. Aside from the writing and direction, strong praise has to be given to Joaquin Phoenix and Scarlett Johansson for their excellent work in the film’s leading roles. Phoenix brings a quiet sentimentalism to a challenging role that would tempt other actors to over act in order to compensate for the absent body of the lead actress. Instead of going over the top though Phoenix reigns it in and always manages to draw us into the relationship he is having with what’s effectively a voice inside his head. Talking of that voice Johansson does a great job at building a character who immediately feels relatable despite being a piece of software. Both are tough roles and both are pulled off with skill and humour. So see Her if you want something a little different to your average rom-com because it’s a well written, observant and delightful little film which is really worth your time. If the concept of a computer based love affair puts you off a little then I promise you it isn’t half as strange and alien as you might think it would be. And that fact, in and of itself, is rather an interesting insight into our present culture. What is the film’s greatest strength? The script I think was the best of many praiseworthy elements. Would I see it again? Certainly. It’s a lovely warm film that strongly speaks to our current generation. Thanks for reading, please do let your thoughts loose in the comment box below! Good review Rumsey. Has plenty of heart, humor and insight into what makes us all human and give us that need for a connection. Not just with fellow humans, but with anyone. Thanks and glad you agree Dan. It took me far too long to get around to this one! Ah yes, this one’s great. One of my favorites of recent years I have to say — mostly on the basis that Phoenix and Johansson have tremendous chemistry with roles that, as you point out, are untraditional and very challenging. The score is also haunting as well. ‘Her’ just worked all around for me. I need to see it again to take in things like the score, I was just wrapped up in the central relationship the first time around! This was my favourite film of 2013. I’m not surprised, it was great! My best film too for 2013. It’s a film that cuts away the moral judgements of the characters and calls on us to simply appreciate what’s true and beautiful. Nice review! Exactly! 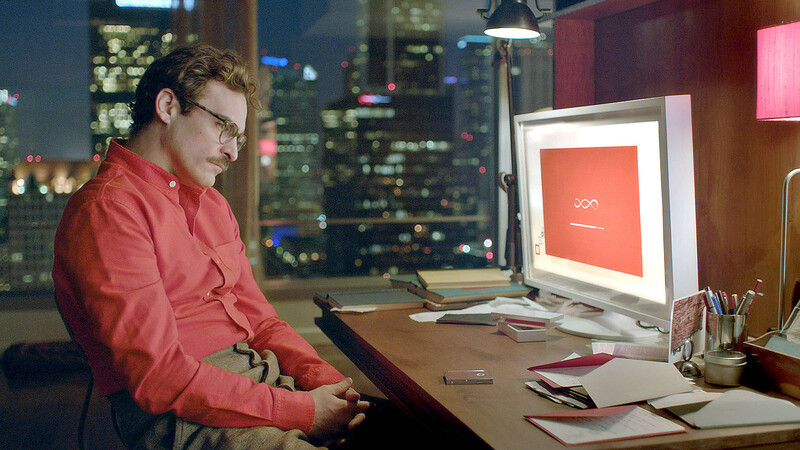 I love how nonjudgmental it is, it’s simply a romantic film that just so happens to involve a computer!